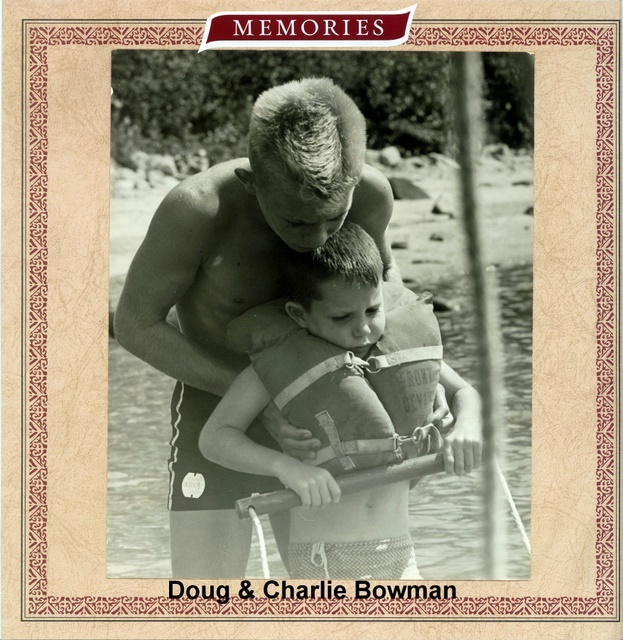 We have received some emails from two brothers, Doug and Charlie Bowman, who spent many years of their youth in the Skerryvore area. They spent their summers living on Pentecost Island but explored Skerryvore many times, especially fishing in Lost Lake (now officially Skerryvore Lake). Here are their memories. Should anyone else wish to contribute to this section we would be only too happy to add your accounts to these stories. I have also included comments from Nancy Rogers of PaBIA who had been included in the emails. Some editing has been done for clarity and remember memories fade over time so some memories may not be exactly correct. ~~~My brother, Charley just sent you a note and then got back to me. 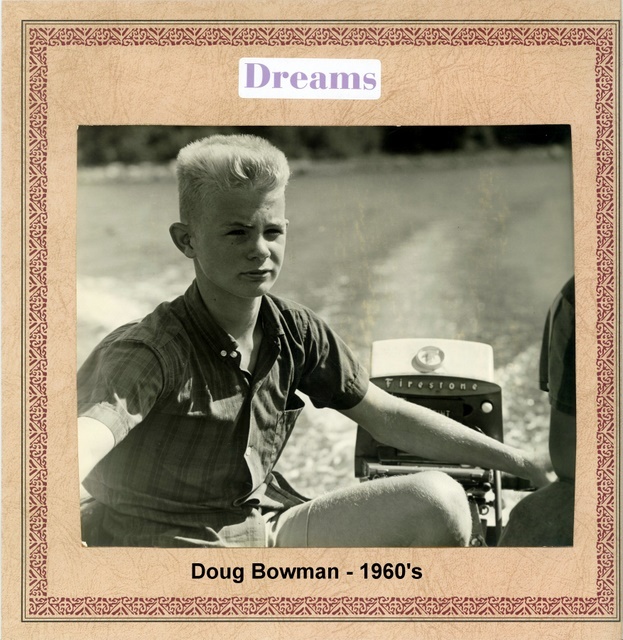 My Name is Doug Bowman. My dad, Vern Bowman managed Wakonda Lodge (Pentecost Island) from 1955-1965 for the Cleveland YMCA. The island cabins, lodge and boathouse were all built under the direction of the previous owner, Joseph Rogers, who had been Vice-President of Addressograph- Multigraph, the predecessor to Xerox in Euclid, Ohio. When he died in '52, his wife left the island to the Cleveland YMCA and it became a "family camp" for the next decade or so. Our first "boat-boy" was Jimmy Walker. His dad, John Walker and mother, Virginia Walker owned the Skerryvore property then. They had 2 sons: Jimmy, Johnny Jr. and a daughter. I think her name was Virginia (Editor - these memories must be incorrect - records show that Mrs. E. M. Barker owned the Skerryvore Hotel and later her daughter Mona and her husband Jim Walker). There were two small mouth bass holes near the rocks in front of the hotel. The water was cold and deep. Moonlight Bay led to a little creek, dammed up by beavers...there were several small beaver dams and then the big dam that enclosed "Lost Lake" We caught the biggest large-mouth and northern pike in that little lake. The only bait we ever needed was a hook, live frog(hooked in the lips), a bobber, live minnows, a red & white Daredevil, a green flat-fish or a hula-popper...Jimmy Walker carved his own out of birch! We (our family and guests that stayed at Wakonda) were the only folks I know of that ever fished that lake back then...and it was all due to Jim Walker's knowledge of the area, having grown up there. There was no culvert then....just a footpath leading to our 4 canoes we kept there, turned upside down, unguarded and no one ever touched them. Wakonda, Pentecost Island was at the mouth of the Shawanaga (Pickerel in Ojibway) River and in the Spring the Game Warden Set up a series of nets along the river to "tag" the pickerel as they ran each spring. And when I was a mischievous kid we would occasionally go out at night in a canoe and raid the nets, and pull up a few large "Wall-eye" as we called 'em, and put them on a stringer, return to the lodge and lie about how and where we caught 'em and then make up stories about what kind of bait we had used! One of the best places to fish was in a canoe, tied to the red channel marker that protruded out of the water in front of our boathouse directly in the mouth of the river. I loved (still do) The Pointe au Baril area.....the Shawanaga River and upper falls, the Ojibway Hotel, the Hole in the Wall, Mud (Christopher’s) Channel, The Main Channel, Heart's Content (owned by Cliff Oustram), Steve's Taxi. The Evoy Brothers ran the post office at the Pointe and Woodward's Marina, Cribby's Taxi, CC Kennedy (old Art). Whatever became of Jim Walker's buddy, Dave Zimmer? He built "Sea-fleas"...a little enclosed bow, flat, like a wedge, with a 18 horse Mercury outboard on the transom. The guy who ran Woodward’s Marina was Neil Rider and they had an Indian, Blackie, who delivered 100lb propane tanks was killed by a bear. One time as we approached Moonlight Bay to portage back to Lost Lake, we ran into a mama bear with two cubs. We got as close as we could in the boat and then the mama bear entered the water, growled loudly and we backed off immediately! So many memories! What a wonderful place to grow up! And my Canadian friends were the best. I always felt that the Pointe was my second home! Is there still a school on Schoolhouse Island? I remember weaving through the back bays between Skerryvore and Wakonda and they very nice to navigate when the front bay kicked up in bad weather. I used to take my little red Peterborough boat with my Evinrude 5 1/2 horse outboard and visit Jim's younger brother, Johnny when he and his parents lived in the cabin behind Skerryvore...a little separate island with one cabin and a boat dock. I had a rattle snake skin collection from the timber rattlers that we killed over the course of each summer. Anyway, thank you for allowing me to "rattle-on" and share some wonderful memories! 'Ow bout that, eh? ~~~Yep, that is what we called Wakonda (I never knew the name Pentecost Island, though I am sure Doug and my Dad did. It was operated by the South Euclid-Lyndhurst YMCA in South Euclid, Ohio. Doug and I will scrounge through some old family photos – they are probably with our parents and we’ll send up what we can. I delighted to be a part of this history. There was a big rock/boulder on the beach (the beach would be farther to the right of the photo). That was “my” rock. That’s where I ate every Friday evening during our Friday fish fries. There was no other meal like the fresh fish that came out of those waters. I certainly wish I could help with the search for information about the Skerryvore History. The only Joseph Rogers that I know about in the Pointe au Baril area was Joseph P. Rogers of Toronto. There's some information about him and his family in my mother, Ruth McCuaig's book "Our Pointe au Baril". He purchased 278A (NW of Ojibway Is.) and 106A (a lovely group of islands east of the Ojibway, now owned by the Bata family) in 1905 and built on the former in 1907. There are still many relatives and descendants of that Joseph Rogers in Pointe au Baril at 278A, 331A and 258A. I don't believe that any of the Rogers families now in PauB (including my husband's) are related to the Joseph Rogers from Euclid, OH - however I may be incorrect about that! 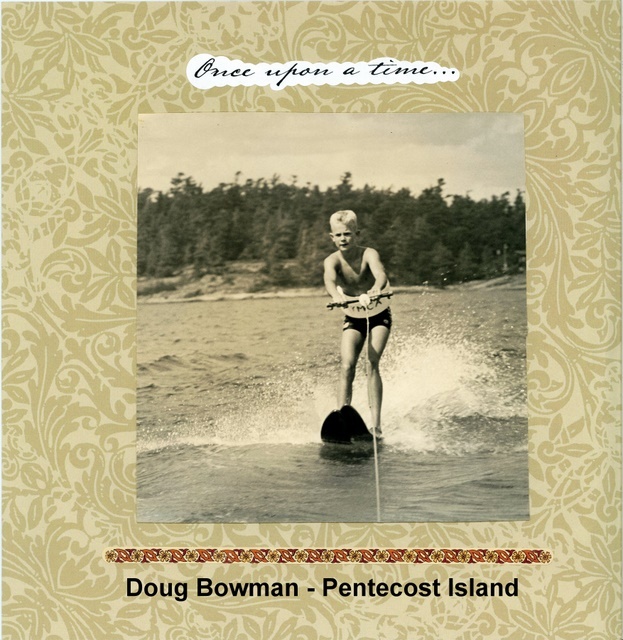 I have searched the Index in "Our Pointe au Baril" for Wakonda Lodge, YMCA, Pentecost Is., etc. and have found nothing. As far as I know, and I have her files, I don't think my mother was aware of the camp, which is a shame. She certainly would have been interested in that history. My parents began gathering information for the book as a centennial project, in 1967. It was finally published in 1984. I'm sorry that your area is not covered as thoroughtly as it obviously could have been! My mother relied on information from permanent residents and cottagers alike as well as archives in Parry Sound, Toronto and Ottawa. There is a section on the Skerryvore Hotel in the book. Ole Hansen originally owned the Skerryvore property. He later moved to the Pointe. 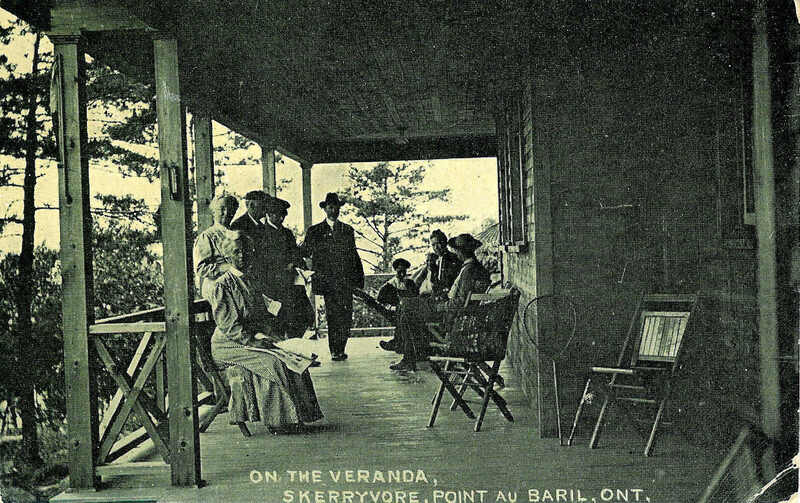 The Skerryvore Hotel was first owned by Miss (also referred to as Mrs.) E. M. Barker. Winters were spent in a log cabin down the shore from the hotel (is that the cabin in the photo sent?) Mrs. Barker's daughter Mona was married to a Jim Walker - that all from info. found in "Our Pointe au Baril". I'm pleased to know that a book is being written about the Skerryvore area. I would certainly be interested in having a copy once it's published. I continue to collect information about Pointe au Baril history, to keep with all my mother's files and copies of the 3 editions of "Our Pointe au Baril". ~~~I would like to put together some thoughts and impressions on Jim Walker, who worked Wakonda, taught us all so much and was a true native of the greater Skerryvore area. Give me a few days. In the fall of 1973 I took my bride home to Georgian Bay. I had one of the Evoy brothers take us out in front of Pentecost Island so I could show her where I "grew up" without TV, radio, bicycles, a ball field or neighbourhood kids to play with. All I had was canoeing, fishing, boating, fishing, exploring nearby islands and learning where the rocks were in the back bays, (did I mention) fishing...and Jim Walker Taught me how to ski around "The Rock" in front of the lodge at the age of eleven and drop one ski and slalom into shore.... Watching moose swim between the islands, fishing in the back bays between the river and Skerryvore and having to sit still in the boat to watch minks and muskrats playing in the water in pairs...finding an antler dropped near a rub and even an entire dear skeleton or a beaver skeleton between the myriad of beaver damns between Moonlight Bay and (Lost) Skerryvore Lake. Or cooking fresh caught pike in a frying pan around 8AM on the rocks over on the far right-hand shore of Lost Lake. Pictures are coming. My 86 year old dad, Vern Bowman (from the Y camp) lives near-by here in Florida and he is currently searching through his slides. Didn't mean to ramble on.....you just ignited things and people I haven't thought about in a few years. ~~~The Jim Walker I knew (who was a friend of Dave Zimmer)...his father I believe was a Parliamentarian, yes, The Conservative Party....he and his wife ran the hotel when young Jim worked at the Y camp. This is ironic, because young Jimmy was kicked out of high school for driving a bulldozer across the athletic field! I do not remember the hotel having any guests after 1962 or 63. Young Jim had a younger sister, Virginia and a younger brother, John, about my age. I'm almost 60. I remember we had a generator shack fire around 1963 and everyone from the islands came from miles around and we contained the fire with one fire hose hooked up to a stranger's inboard/outboard. The rest of the ground fire was handled by bucket patrols! That's how it was back then. We had a wonderful "community". Everybody in town and at the Ojibway said Hi and everyone passing by in a boat waved! Still setting aside slides! Did you know the sun sets every night directly over the main channel? It’s beautiful!! ~~~Thanks Tom! When Jim Walker became more scarce at the Pointe in the late 50's, early 60's, I had heard he got married and settled down as a mechanic in Toronto. About the "growth "up there"...when I was a kid in the 50's, the QEW was a two lane gravel road from Parry Sound to Pointe au Baril Ste (Editor - actually it was highway #69). Then it was a four lane paved highway by the mid-60's (Editor - he must be referring to highway #400). I am grateful for the time I got to spend there....where is Nobel? The local kids used to go to school on School House Island and the high school kids had to take the school bus to Parry Sound.....not an easy trip in the winter! ~~~I am sorry to hear that the fishing has diminished slightly from my childhood days growing up in the mouth of the Shawanaga River. My dad used to stand on the rock-shore of the Y camp just down from the dining room (second set of windows left of the screened porch) window of the lodge and cast out from the shore using a red and white daredevil with some pork rind and catch 30-36 inch pike about once a week. The back bays between Pentecost and the back entrance to Skerryvore always provided lots of pike and bass. Here's a story...Jim Walker and Dave Zimmer gathered some gallon glass bottles with caps and spread them out all over between our island and the main channel. There were two lines coming down into the water...one with a rock (anchor) and the other with a line with a treble-hook. We hooked a small perch (perfect pike bait!) to the treble hook thru the back of the fish. There about ten or 12 of them all set up to do a little "bottle-fishing"....when the large game warden's boat was seen crossing the water between us and a little place called Heart's Content. My dad set out in a small Peterborough fishing boat and shot out some of the bottles with a 22 rifle while Jim Walker sped around the water hitting each bottle with a hammer, so it would break and disappear. The game warden came around the red channel marker and kept going up-river on the Shawanaga! At the end of the river towards the left side of the opening there is a small lake up above dammed up by a beaver dam (or there used to be). We pulled many largemouth bass and pike out of there as well. But Lost (Skerryvore ) Lake was where we got our great abundance of fish. In the 50's through the mid 60's it was beautifully private and secluded and a hula popper or live frog on a bobber would catch breakfast forever and by 10Am we were done with at least one or two stringers full. We threw back any pike under 30 inches and any bass under 2lbs....NO fish story. The rocks in front of Skerryvore required a long anchor rope. Put a live minnow on your hook, drop it to the bottom...reel it up two turns and wait...many a good small-mouth could be found there and they seemed to school in that location forever! We only fished with a red & white daredevil, a green flatfish, live minnows, frogs and perch and a trusty Shakespeare reel and spinning rod. You can keep 4 or 5 live frogs in an old wet sock and tie it to your belt! ....learned that from Jim Walker. Nobody fished with worms, unless they were fishing for bass, crappie or perch inside the boathouse, fishing between the pilings, inside....you could see bottom at 15 feet so it was easy to watch the fish swim out of between the logs and bite your hook. All you had to do was pull up quickly and set the hook. It was like shooting fish in a barrel! ~~~I want to ask if anyone knows when Joe Rogers built the camp. The boathouse had a work shop and an apartment with a pump sink and a head. The next cabin on the left going toward the lodge was The Euclid House, named for where the Rogers family lived, in Euclid, Ohio. The Euclid House had a large front porch and both front and rear bedrooms and one bathroom in the middle. All of the "paths" were paved with flat field stone and concrete...Mrs. Rogers insisted...she hated snakes! To the right of the path was the ice house full of saw dust covering huge blocks and chunks of ice and then the generator shack. During usually February, the Indians would cut ice out of the bay for the various "Camp" and "cottage" ice-houses. Most islands had no electricity. We had an old Ford generator and two 55 gallon drums mounted in the rear behind the building that we kept gassed. We had electricity from 6AM til 10AM and then from 7PM until 10PM. On either side of the main lodge we had two cabins, a bedroom on each side and a center/common bathroom. We had flush toilets and hot and cold running water. We had a water tower on top of the island and huge stone fireplaces in the living room and dining room. We picked blueberries on the top of the island from July till mid-August. My brother and I got sprayed once by a mama skunk who thought one spring, we got too close to her kits. We had a few porcupines that the cook fed from the bridge behind the kitchen. She fed the skunks fish and pork chop bones. The beach-house had steps that led down to the beach with a large birch tree that hung over...and down further was a protrusion of rocks and then another smaller beach where we had big fish fries every Friday night...fish cooked in a huge frying pan battered over a wood fire....and coleslaw...and blueberry pie! ~~~Excellent! Yeah we used those for bait! Above every "fishing locker" in the Wakonda boathouse there used to be a Muskie head mounted, gills spread and mouths open. Each was labeled as to size and where it was caught. 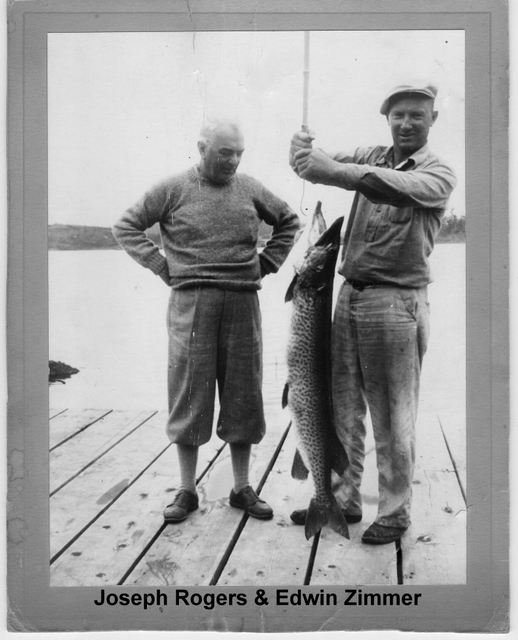 By the 1950's we didn't catch many muskies...but we caught a LOT of good sized Northern Pike. Thanks for the picture!. I'll get back to you. ~~~Isn't t funny that sometimes a story reminds us of another story? I remember that Dave Zimmer learned how to build "sea fleas" from his dad...as illustrated by the photo, circa 1939...now THAT got my attention...1932...Dave's dad was way ahead of his time! Its like a Porche with an outboard motor! One afternoon Dave Zimmer stopped out at Wakonda Lodge (The Y Camp) and we had some guests that included the daughters of a Cleveland industrialist and they had taken quite a liking to our "boat-boy", young Jim Walker. Both of these guys were about 18 or 19 years old. Dave's "sea-flea" looked like a Porsche on the water. I think he had just finished this one the previous winter. Jim had a routine where he would "wash" his blue jeans by putting them on, soaping them up and then he would jump on a pair of skis and get someone to pull him around the "rock" exposed in front of the patio in front of the main lodge, where he put on a show of criss-crossing the wake, jumping the waves and smacking his skis down on the water, then he'd drop one ski and the tow rope and slalom into the beach. Girls loved it. Now, getting back to Dave...Jim decided to ski off the low dock at the boathouse after soaping up his jeans, and Dave cleated the tow rope from the transom. Dave revved up his Merc outboard, threw it into forward and as Jim hit the water, the transom pulled off from the sea-flea and the bow pointed toward the sky and the Merc gurgled to a stop. Fortunately, the engine was chained to the boat. They got the boat out of the water before the Shawanaga's current took them too far and Jim helped him haul the boat back to the station. It was one of those stories that took a few weeks before it was funny! I guess you had to be there!! Joe was Vice President of Addressograph Multigraph, the predecessor to Zerox. These copy machines were used in every school and every office building across the country and through-out the world...and they didn't have competition. So, yes, he was loaded!!! His wife donated the island to the Euclid Y, lock, stock and barrel. Euclid Y could not turn a profit so they turned it over to the Cleveland YMCA. The head of the Cleveland Y hired my dad to manage the camp from 1955-1965. Then another guy from Cleveland Y named Bruebaker managed it for a few years, spent too much money, and was not a good money manager and the Y had to sell the camp around 1967 or 68. Thank you for the information. I will certainly show it to my dad. I am in the process of copying more pix from when I was a kid up there and send them off hopefully tomorrow afternoon. Tom, I cannot tell you how much these past two weeks or so have meant to me. Thank you so much!!! ~~~These (pictures)are about all I have left. One shows me helping my little brother, Charley learn to ride an "Aqua-Plane". Another is me taking a boat for a spin. 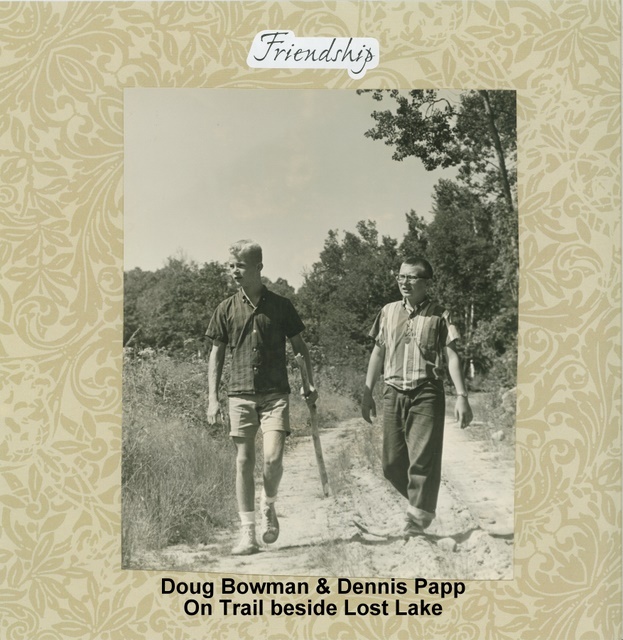 One picture has me and a kid named Dennis Papp walking the first "path" someone put in on the left side of Lost Lake around '63. The one on water skis was taken in front of Wakonda Lodge, going around the rock that sticks up just off the beach in front of the lodge also shot in either '62 or'63. My dad, over the years threw away the boxes of slides as he moved around Ohio and Florida. I had these in my scrapbook. Sorry, no shots of the beaver dam. In the shot with me and a "guest" at Wakonda, Dennis Papp, I'm walking with a beaver stick in my hand. The bark had been chewed off and both ends bore beaver tooth marks from being chewed and removed, probably from a nearby birch tree. My dad sends his regards and he said to say thanks for the pictures and information. He wishes you best of luck with your history of Skerryvore. As I have said many times before, those were special times and very special people. ~~~"It looks almost well used in your photo? Can you tell us what it was for or who was using it? We always assumed it was an old logging trail". That road must have been put in with not much more than a bush-hog. That area had been all cattails and reeds growing out of a sand base. The road suddenly appeared spring of 63'...My dad figured that someone must have purchased the old Skerryvore and it appeared (to us) that maybe they were looking to build cottages facing the lake. I ventured up there in '74 with two old buddies and stayed at Mount View at the Station and by then someone had torn out the beaver dam and put in a culvert we poled through....they let the fish out! I caught nothing but a small pike not big enough to keep. No cabins, yet. That little self-contained habitat was a perfect fishing hole because so few people knew about it. We wouldn't have found it either, but Jimmy Walker guided us in there once a week for several summers. Casting hula-poppers early in the morning into the lily pads produced large, large-mouth bass. Later on red & white daredevils hooked the pike. Still-fishing with frogs and bobbers caught bass and pike all day long. We would catch the frogs along the beach on Moonlight Bay where we would "beach" the camp boat, a 22 foot covered bow Peterborough. We would shove three or four frogs into wet (old) socks and then tie them to our belts. By 9AM we always had fish and eggs for breakfast...and something that resembled coffee. We cooked up on the rocks on the right toward the end of the lake. All left-over food was gathered and then put in the cooling frying pan and left for the raccoons. Then we'd go back to our canoes in the water and return to fishing. The whole time we used Lost Lake, never did we put an outboard engine in the water...it was so clean...we always used canoes....and canoes were quiet. The raccoons would come out, eat the scraps and then we would return for lunch and do the same thing. Ya know I haven't thought about that in years. Have a great day! Just received the notice you sent concerning the "nurse station" in Pointe au Baril Ste. When I was a kid up there, the only medical attention we could seek was old Doctor Pease. He had a cabin on an island between Wakonda and Heart's Content, owned by Cliff Oustram. Dr. Pease was ancient but Mom kept in touch with him as my brothers and I went through measles, mumps and strep throat. Back then if someone got bit by a timber rattler they got a quick tourniquet and got rushed to Parry Sound. Its good to see modern medicine has arrived in the islands. Thanks for the info. Keep in touch!